Looking for things to do in Hong Kong, I learned in the hostel that Macau, another Chinese Special Administrative Region, is a short 1 hour ferry away. 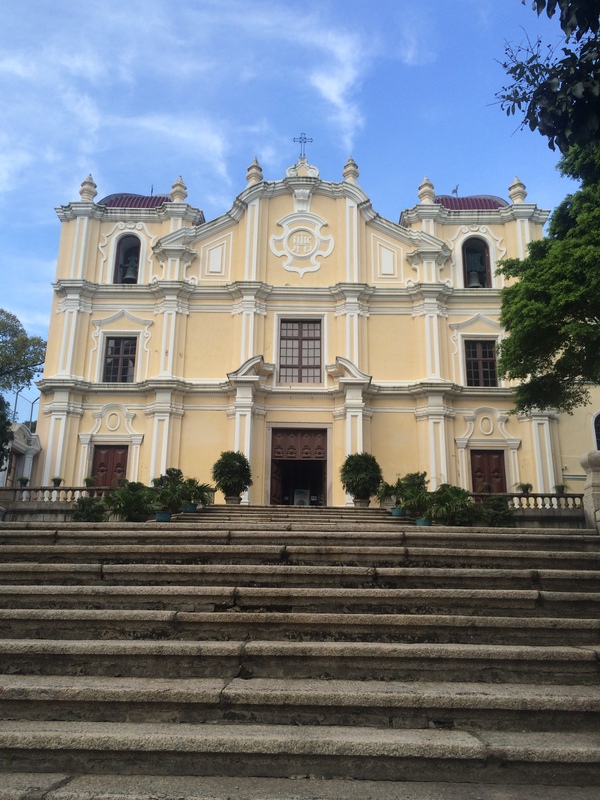 Macau is best known as the gambling capital of the world, but also has a 500-year old historic centre, as it was a Portuguese colony from the 1500’s all the way up until 1999. 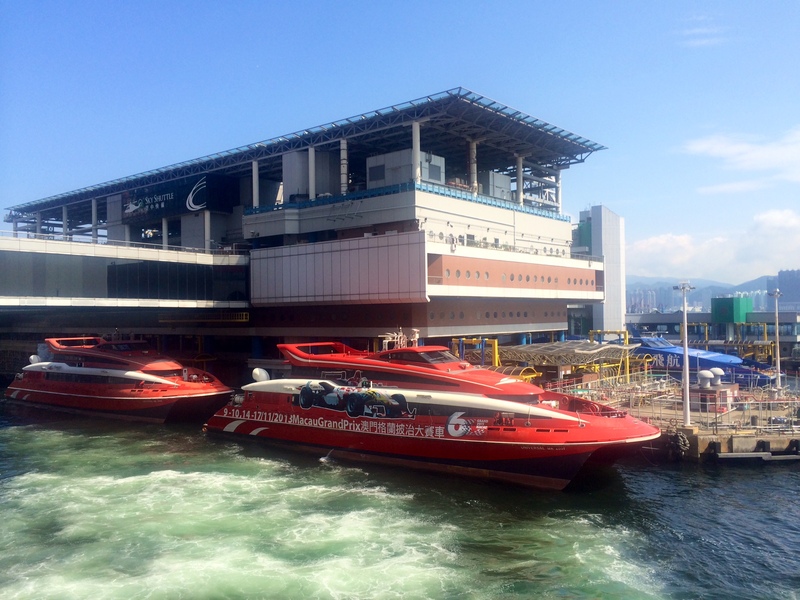 The ferry terminal is located directly next to the Sheung Wan station and runs ferries to Macau every 15 minutes all day. Seats on the ferry are assigned and I lucked out and was seated next to Laurent, a engineer from Geneva who works for Swiss Airlines. Laurent is a a seasoned traveller who has been to 35 US states and countless other countries. 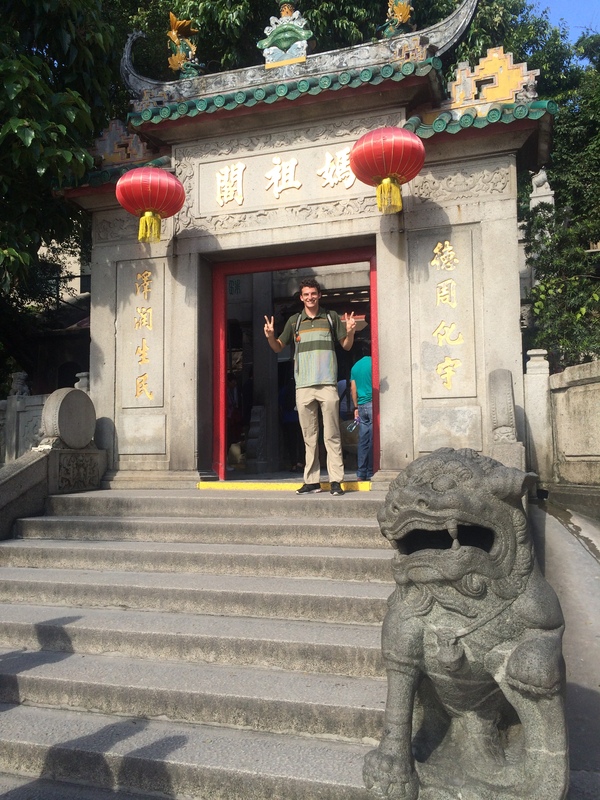 For the day in Macau, he had compiled a list of 45 attractions, created a walking plan, and included all the history of each spot on the walking tour. He had really done his research. I asked if we can walk around together and he said yes. While Macau has a public transportation system, the signs are only in Chinese and Portuguese. We learned that the best way to get around is on the free casino shuttles. Since the casinos are located all over the island, you can go pretty much anywhere for free using them. 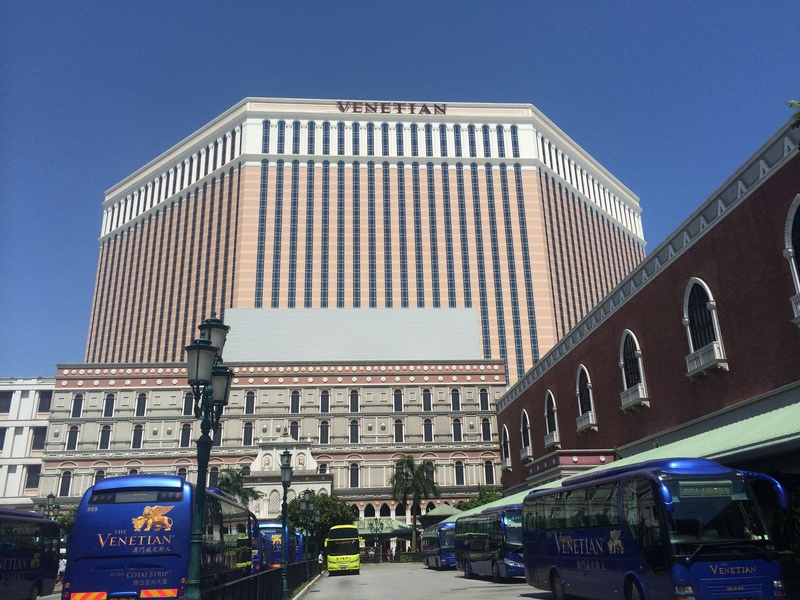 So using the shuttles, we went to the Venetian Macao, the world’s largest casino and the world’s 6th largest building by floorplan. The casino is absolutely massive- 40 stories tall. Inside, it looks just like its Las Vegas counterpart, except much larger. While it has many Western stores, it also has a lot of Chinese stores. Some of the Western stores seem really random: Fatburger, Manchester United, and True Religion. The Venetian has 330 stores just on the 3rd floor. On the casino floor itself, there are over 800 gaming tables and 3400 slot machines plus dozens of private gaming rooms. There are also 3 canals on the 3rd floor complete with gondolas and a replica of St. Mark’s Square. I was texting my good school friend, Sarah, who put me in contact with her friend Josh who actually works at the Venetian Macao. Josh, Laurent, and I all got dim sum together. 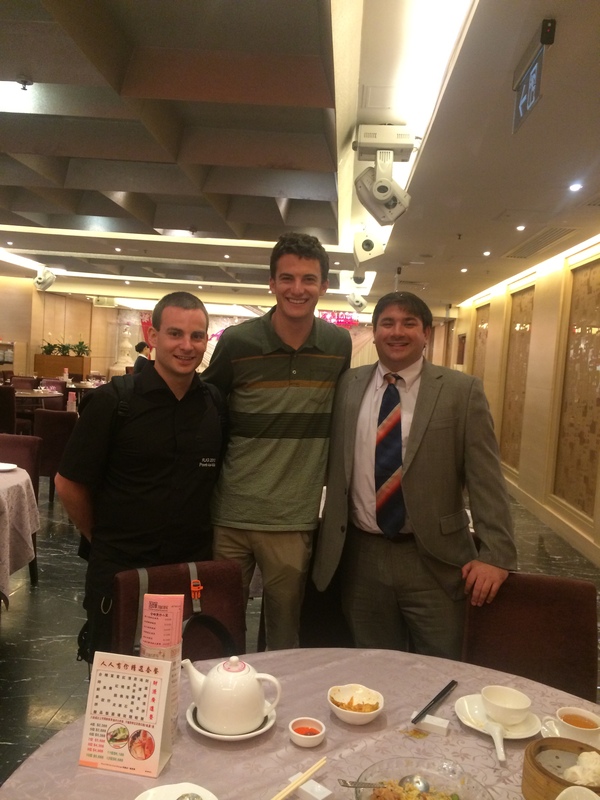 Josh explained how that Macau is so successful because it is the only place in China that allows gambling. While there used to be a monopoly on only Chinese companies, the big boom happened once Beijing let the Western companies compete in the Macau market. Now with China’s economy booming, Macau is by far the largest gambling market in the world. It makes the equivalent of 7.5 Las Vegases in total revenue. 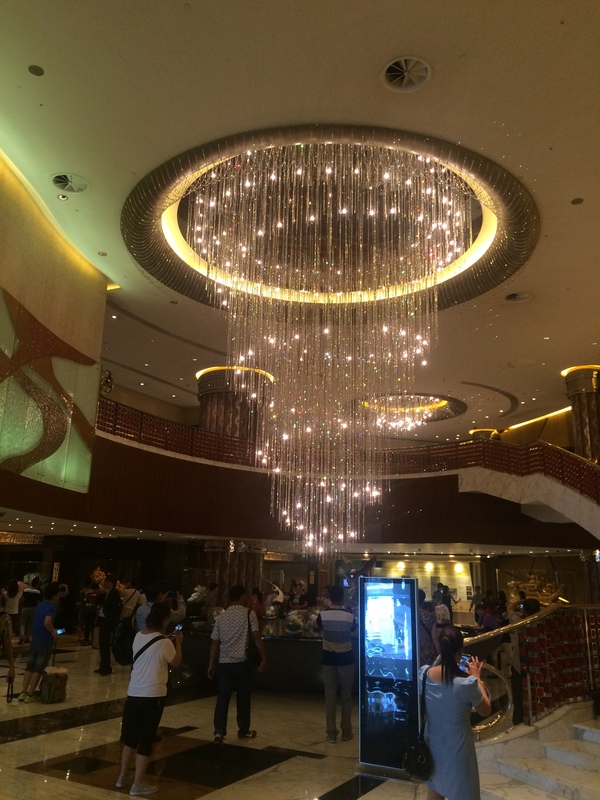 The hotels in Macau function very differently from their Las Vegas counterparts. One main difference is on the casino floor. Most of the Chinese who come to gamble legitimately believe they are going to win due to reading astrological charts. They don’t play slot machines and don’t drink alcohol while gambling; rather, they sip tea and play table games. These trips aren’t fun and games, they are ways to make money. As a result, there are more big money gamblers and the average person spends more money at the casino than in Las Vegas. 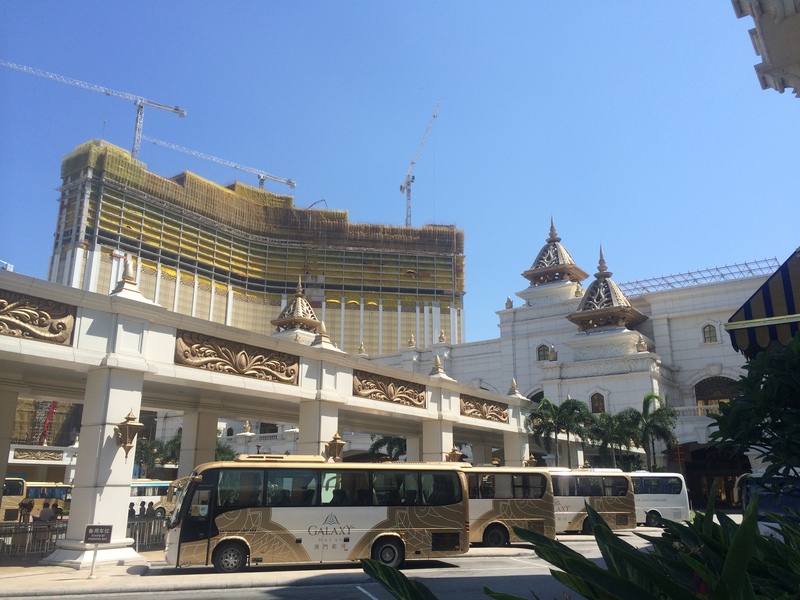 The gaming industry has caused Macau, with a population of 300,000 to have an unemployment rate of 1%. Additionally, each citizen of Macau gets a check around $1,000 US every year just because the government doesn’t know what to do with all the money. 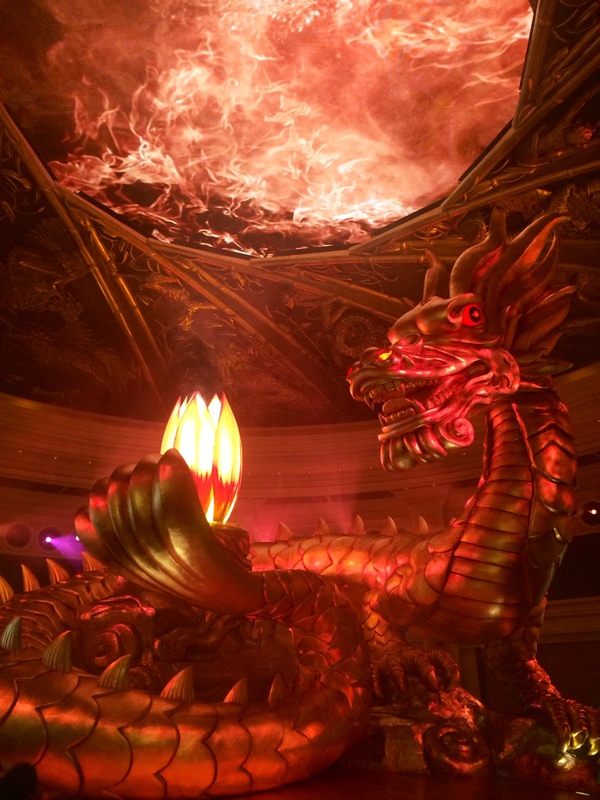 Why not have a giant dragon in the hotel lobby? 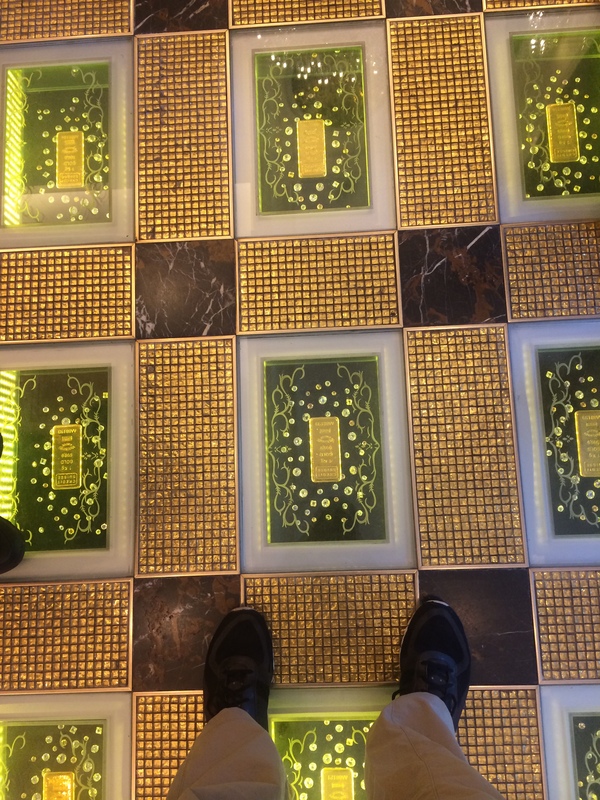 We have so much money that we put gold bricks in the floor. 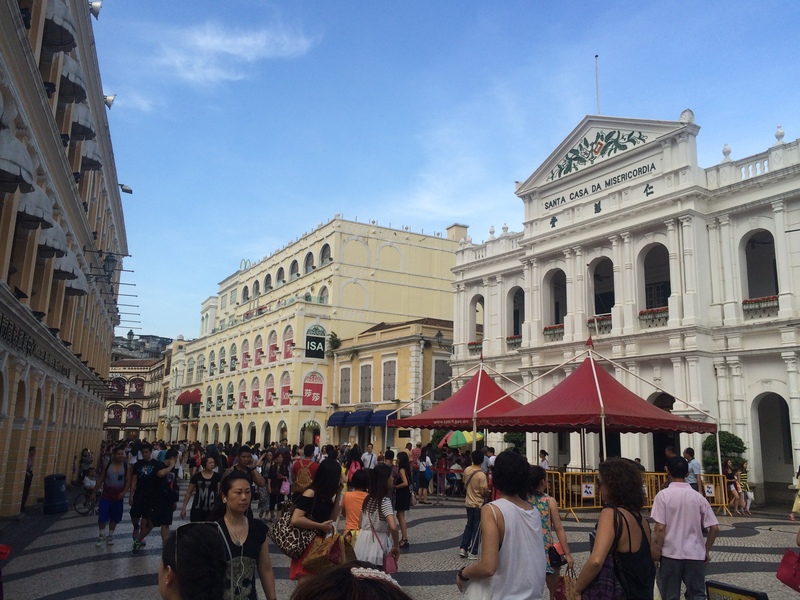 Just past the Emperor Casino is Old Macau, the original Portuguese settlement and a UNESCO World Heritage site. Laurent mapped out the 28 protected historic buildings and we went to all of them. The first one was a Chinese temple. and the ruins of one. The main part of Old Macau had windy mosaic streets. It looked like it could be in Europe. 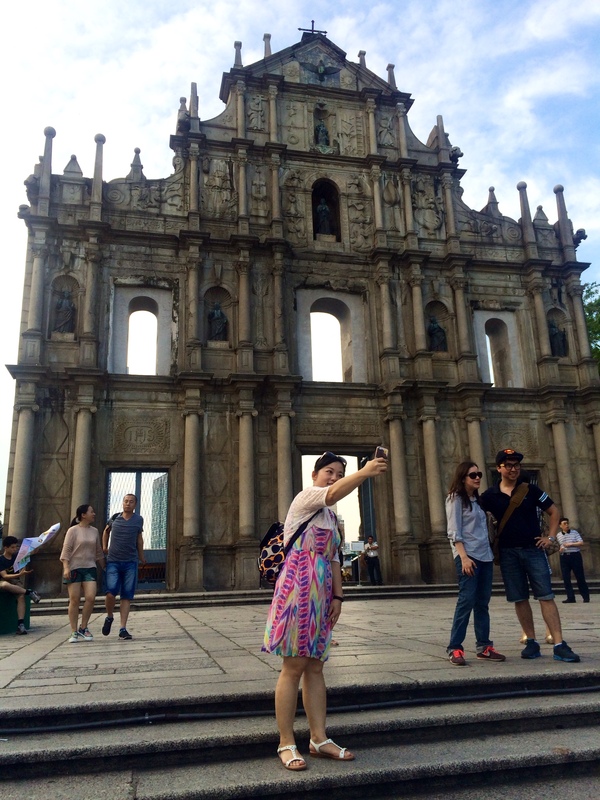 Overall, I liked Macau more than my first day in Hong Kong- most likely because it is such a strange place. That said, one day here is plenty.